HomeWORLDWas the Austrian Election “Stolen”? Was the Austrian Election “Stolen”? IS THERE AN ELITIST EU AGENDA BEHIND AUSTRIA’S VOTING IRREGULARITIES? Yesterday, I re-published a brief article about how vote-counting irregularities following the Austrian presidential elections were now being investigated. With a too-close-to-call election last Sunday between the populist right candidate Norbert Hofer and the Green Party candidate Alexander van der Bellen, the correct counting of the postal vote was crucial in an election decided by little more than 31,000 postal ballots or 0.6% of the vote. Van der Bellen’s eventual win declared Monday was marked by a sigh of relief in the political mainstream that the ‘far right’ party under Hofer had not become the first in Europe to be elected to power. But did this close shave prompt some illegal maneuverings from on high? An excellent article in the New American by senior editor William F. Jasper puts this in a bigger context for us. EU elites may possibly have been behind this judging by the desperate, hypocritical and unprofessional sentiments expressed before and after this election in Brussels. trigger a “rule of law mechanism” for countries that depart from democratic norms by putting a government under constitutional supervision. Ultimately, a country can be stripped of voting rights in the EU or have funding blocked. In a test run for the new EU constitutional powers, the commission has issued unprecedented orders to Poland, instructing the newly elected right-wing government to bow to Polish judges who have struck down laws passed by the parliament. What is the definition of departing from ‘democratic norms’ here? Hofer has said he will use an executive power given under the Austrian constitution to call an election at times favorable to his party. Executive orders have been used considerably by Obama and latterly by President Francois Hollande of France to pass his Khomri Law which has currently sent the nation into protests and strikes. With not a peep out of Juncker it needs to be said. “The EU will isolate and use sanctions against any far-right or populist governments that are swept to power or presidential office on the wave of popular anger against migration,” the Times (of London) reported — without any apparent disapproval — regarding Juncker’s arrogant threats. Enjoy Jasper’s analysis of the hypocrisy of the unelected power-grabbers at the EU. Were “election irregularities” in Austria’s presidential election on Sunday actually vote fraud? Did EU elites use extreme tactics to steal the election from a “fed-up” electorate that is rebelling against the EU-imposed migration onslaught, economic stagnation, gestapo-like political correctness, and bureaucratic regulatory tyranny? That may well be the case. The razor-thin election result in Austria’s presidential race last Sunday was heralded by EU politicians and the establishment media worldwide as a hair-breadth “escape” from a “far-right” takeover. When the live vote was counted Sunday night, the result was too close to call. Would Austria’s next president be “far right” Norbert Hofer of the Freedom Party or the “moderate” socialist Green Party candidate Alexander van der Bellen? The result would be determined by postal votes, with nearly 900,000 Austrians — 14 percent of the voters — casting their ballot by mail this year. On Monday, the tabulation of the mail-in vote was announced to be in van der Bellen’s favor, by a mere 31,026 votes, or 0.6 percent. 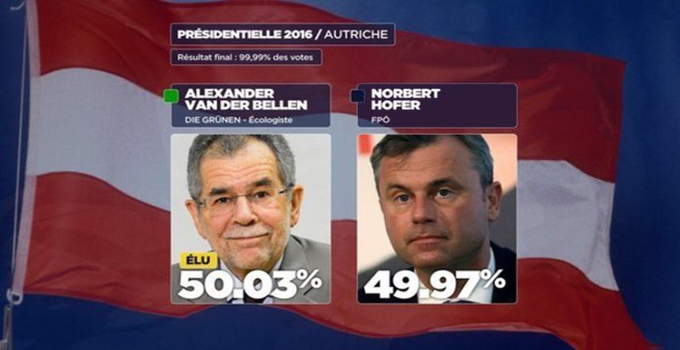 According to election officials, van der Bellen had squeaked out a 50.3 percent of the vote total to Hofer’s 49.7 percent. There were immediate charges by some Freedom Party supporters that the election had been “stolen.” However, Norbert Hofer called upon his supporters to remain calm, and while graciously conceding electoral defeat, said he would be working even harder to insure the Freedom Party wins big in the next parliamentary election. “It will be impossible to keep us out of government,” Hofer said on Tuesday. According to an official statement from Interior Ministry spokesman Robert Stein, the “irregularities” all involved the opening and “counting” of postal votes the night before they should have been. The Interior Ministry has not said that there has been any fraud, and that its investigation — at this stage — merely wants to “close the gaps” in how tens of thousands of postal votes could have lain opened all night. The investigation will focus on four towns in Carinthia which have so far been confirmed cases. The investigation was started after the Interior Ministry received an official complaint against the city of Villach in the south, introduced by the state’s official Economic and Corruption Prosecutor’s office. According to the complaint, directed by the head of the electoral commission, postal votes were opened on the Sunday and “counted” without the presence of electoral witnesses. Officially, all postal votes were supposed to be kept under lock and key, and only opened in the presence of witnesses … on Monday morning. Stein, who is Head of the Elections Department of the Ministry of the Interior, said in his statement that following on from the Villach complaint, a further three similar cases have been identified. The three additional towns identified were Villach Land, Wolfsberg, and Hermagor. After initially saying there was no evidence of voting fraud, Hofer and Freedom Party chairman Heinz-Christian Strache have stated that they are looking into the new charges now being investigated by the Ministry of the Interior. Regardless of the outcome of the official postal vote fraud investigation, it is clear that the prospect of Norbert Hofer’s presidential run was a matter of great alarm in the higher circles of power inside the European Union. Jean-Claude Juncker, president of the European Commission, the autocratic bureaucracy that wields the real power in the EU superstate, was especially abusive and intrusive in the lead-up to the election. “The prospect of seeing the far-right win forces me to say that I don’t like them,” Juncker told French newspaper Le Monde on the Friday before the vote. “The Austrians don’t like to hear this but I don’t care: there is no debate or dialogue with the far-right.” That was but one of his many inappropriate, partisan remarks attacking Hofer and the Freedom Party. Jean-Claude Juncker, president of the European Commission, made clear at the weekend that Norbert Hofer would have been frozen out of EU decision-making if he had been elected president of Austria. 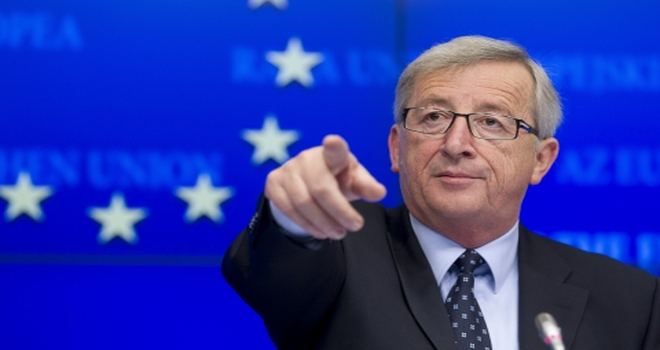 “There is no debate or dialogue with the far-right,” Mr. Juncker said. Juncker and his fellow globalists — especially those in the major corporate media — wasted no opportunity to label Hofer and the Freedom Party as “far right,” “extremist,” “racist,” “xenophobic,” “Nazi,” “Islamophobic,” and “anti-immigrant.” In fact, it is difficult to find a headline or “news” story about the Austrian election that does not include “far right” as though it is an official part of the Freedom Party’s name (e.g. Far Right Freedom Party, FRFP). Van der Bellen is a “moderate,” naturally, because he endorses homosexual “marriage,” LBGT “rights,” more Islamic “refugees,” more EU centralization, more and more restrictions on national sovereignty, etc., etc. However, the 72-year-old van der Bellen, a grizzled and disheveled economics professor and career politician, appears to be far more authoritarian than the affable and dapper 45-year-old Hofer. And certainly more uncivil. “I don’t want that Austria becomes the first country in western Europe led by a populist right-wing, pan-Germanic fraternity member,” van der Bellen told Austrian voters. He also vowed not to swear in Freedom Party chairman Heinz-Christian Strache as chancellor if the party, currently ahead in polls, wins the next general election scheduled for 2018. That remark prompted Hofer to call van der Bellen a “fascist green dictator.” Of course, although van der Bellen, Juncker, and their allies have smeared Hofer and the Freedom Party with the Nazi label, it is really the Eurocrats themselves who more aptly fit that brand. The official name of the Nazi Party, after all, was the National Socialist German Worker’s Party. They were ultra-left-wing socialists and authoritarian environmentalists — much like their socialist brethren led today by van der Bellen and his Greens. Pam Barker is a TLB staff writer/analyst based in France. She has an extensive background in the educational systems of several countries at the college and university level as a teacher and administrator. What is the World Bank and the International Monetary Fund’s Function & Goal? 1 Comment on Was the Austrian Election “Stolen”?